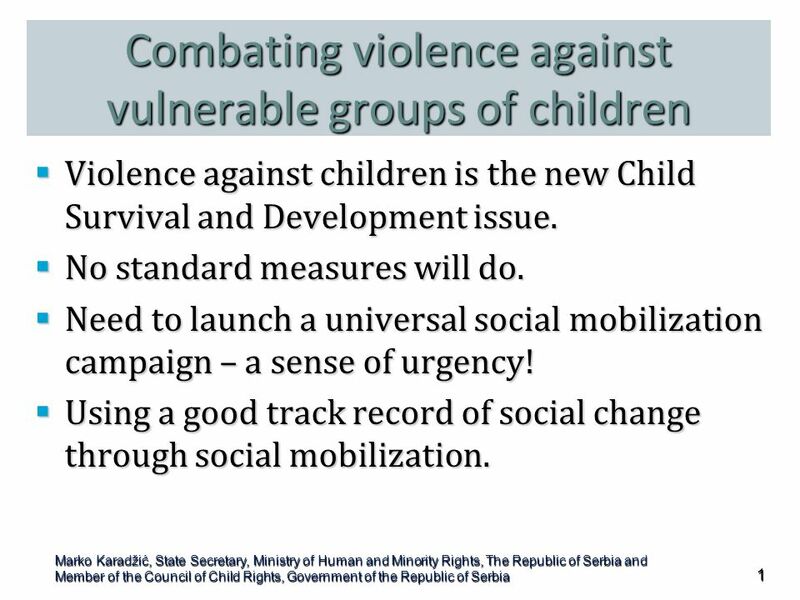 Combating violence against vulnerable groups of children  Violence against children is the new Child Survival and Development issue.  No standard measures. 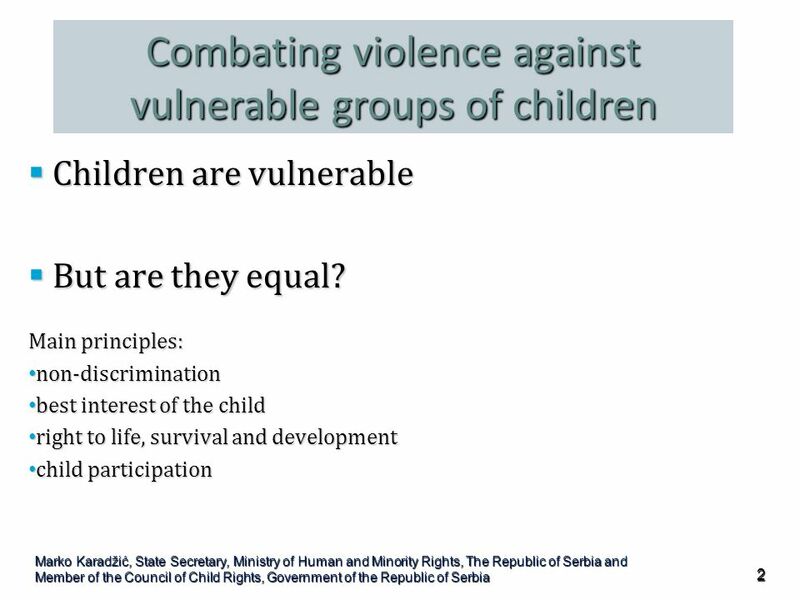 Download ppt "Combating violence against vulnerable groups of children  Violence against children is the new Child Survival and Development issue.  No standard measures." 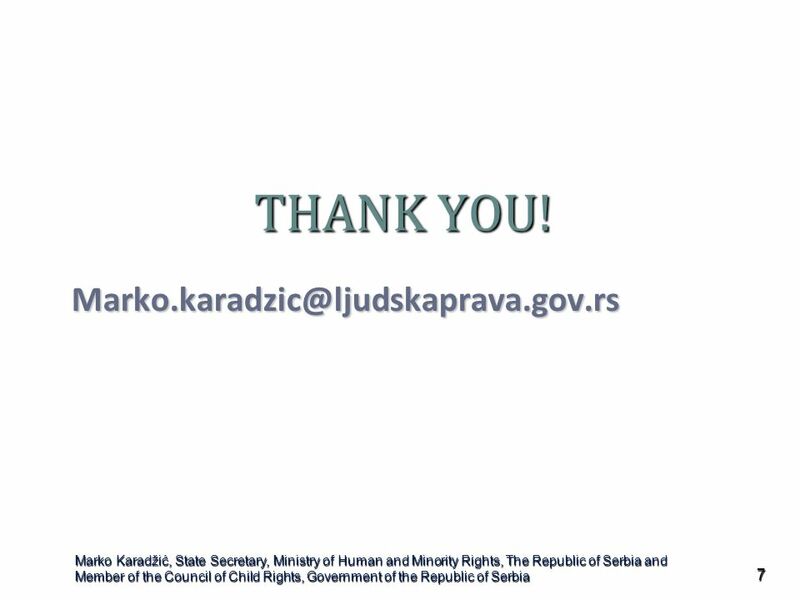 SUPPORT TO DEVELOPMENT OF ANTI-DISCRIMINATORY SCHOOL ENVIRONMENT FOR ROMA NATIONAL MINORITY CHILDREN Minority Rights Center, Belgrade, Serbia. Children with Disabilities UNICEFs Approach and Country-level Programming. Roadmap for Future Reforms Serbia Ljiljana Lucic, State Secretary, Ministry of Labor and Social Policy Sofia, July 2007. 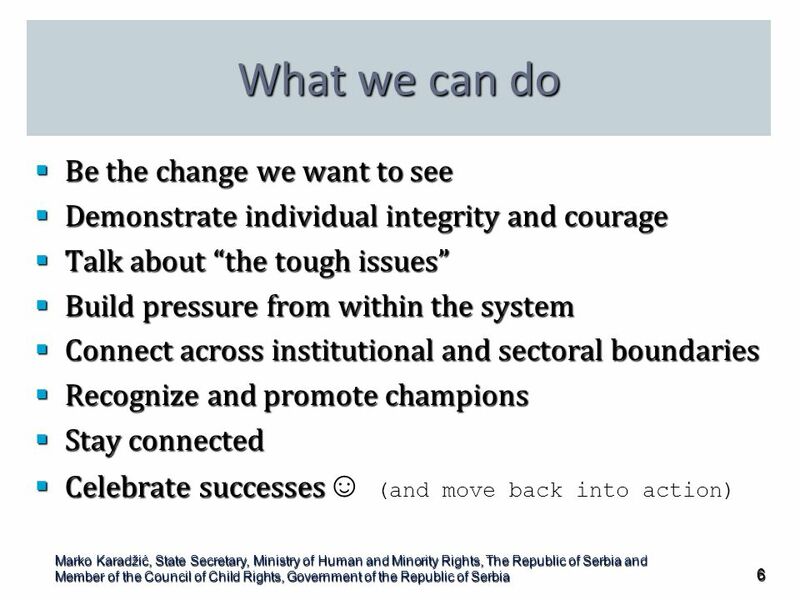 What are key underlying principles and accepted strategic approaches for addressing monitoring discrimination? 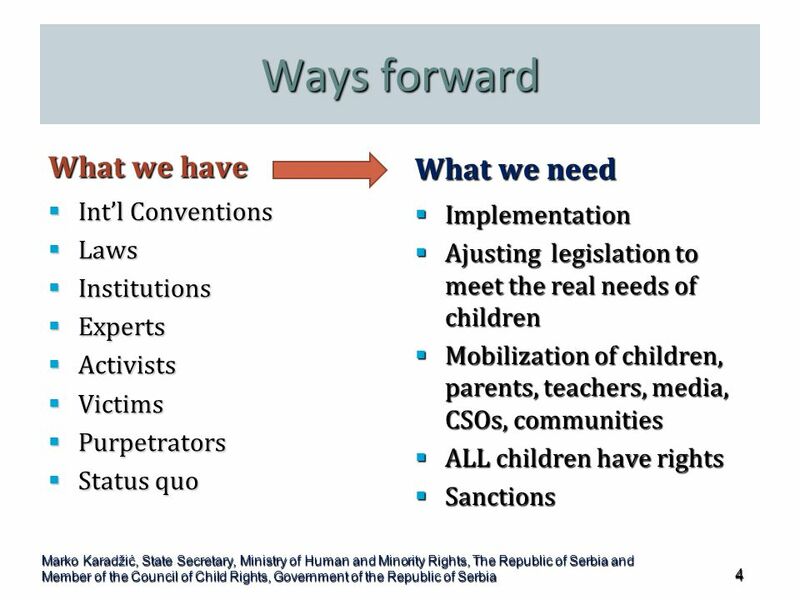 Partnership Participation Child rights approach. 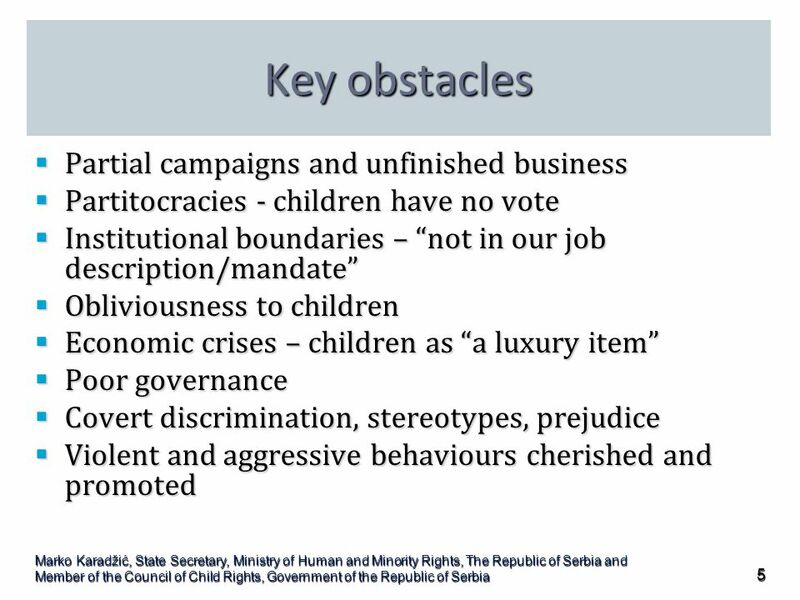 CHILD RIGHT TO HEALTH Judita Reichenberg UNICEF Area Representative for Serbia and for Croatia 21 April 2008. What is equal opportunity? How it is addressed at the European level? Associate Professor Zeynep KIVILCIM Istanbul University. Analytical synthesis of the “lessons and proposals” from seminars and workshops organized in Slovenia Franc Mlinar, MA, ISCOMET Institute for Ethnic and. Your Rights and the UN Convention on the Rights of Persons with Disabilities. 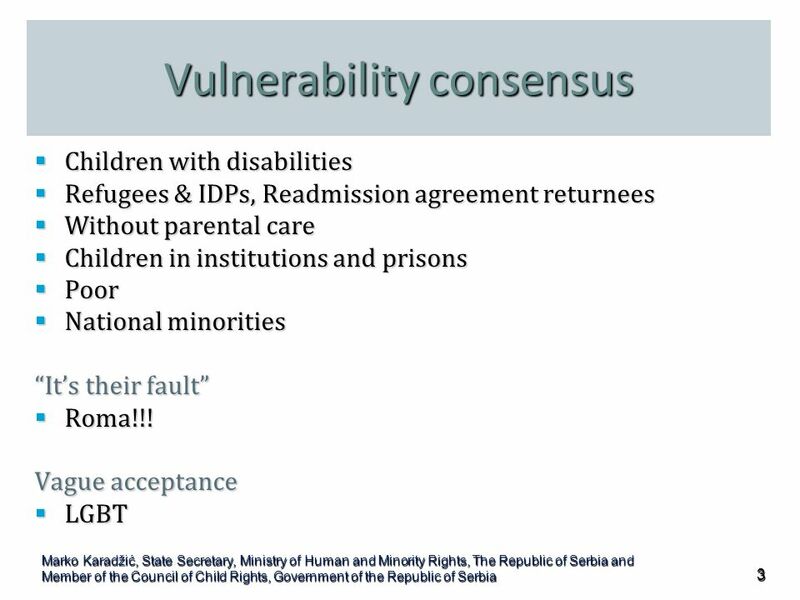 SASTIPEN – ROMA CENTER FOR HEALTH POLICIES FROM ROMANIA Our vision Acting for a society which accepts diversity, where people are healthy and support each. World Organisation Against Torture Mandate OMCT is engaged in the fight against torture, summary executions, forced disappearances and all other forms. Saliha Đuderija, Mr. sci. Ministry for Human Rights and Refugees of BiH. Protector of Citizens: Annual Report Gender equality Protector of citizens Deputy Prof. Zorica Mrsevic, PhD. DE - INSTITUTIONALISATION STEP TOWARDS EQUAL OPPORTUNITIES IN MACEDONIA Ministry for Labour and Social Policy State advisor Mr. Deni Gjorchevski REPUBLIC. 2014 results, challenges and opportunities UN Women in Europe and Central Asia. Human Resources Development OP MINISTRY OF LABOUR AND SOCIAL POLICY REPUBLIC OF BULGARIA Opportunities for investment in children's future Gergana. An Introduction to Inclusion. Benefits of Inclusion. Professor Mona O’Moore Anti-bullying National Research and Resource Centre Dublin City University Ireland Sonet-Bull EU project, Liege, 27 th May,2015.